This month’s competition proved much harder than I thought it would. But congratulations to Mr Pichardie who correctly identified this US Marine General as Lemeul Shepherd Junior. A signed copy of Michael Burleigh’s ‘Moral Combat’ is on its way to you. Shepherd had one of the toughest wars of any battlefield General and deserves to be much better known. He was a Marine commander during the brutal and unforgiving ‘island hopping’ campaign in the Pacific. These were deadly offensives – as viewers of Sky’s ‘The Pacific’ will know. Shepherd commanded units on Guadalcanal, Guam and then, as a two star Brigadier General leading the 6th Marine Division, on Okinawa. 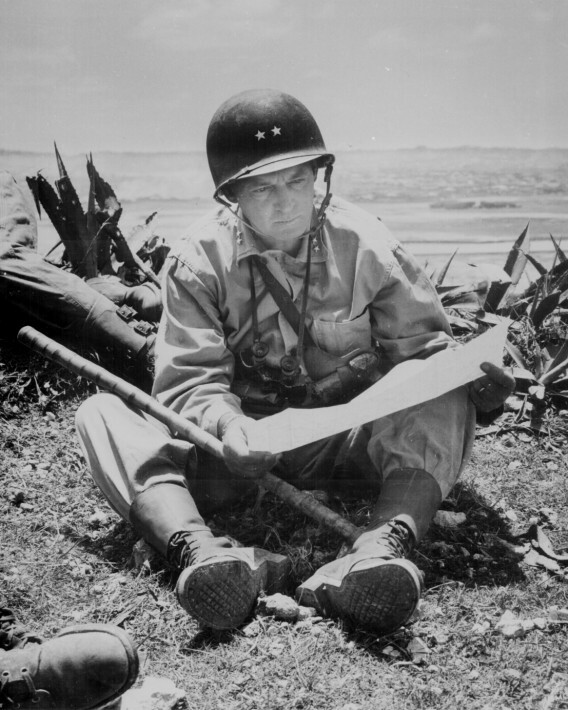 The photo above captures a pensive Brigadier General Shepherd on Okinawa. I’ve interviewed both American and Japanese veterans who fought on Okinawa and their stories tell of a hell on earth. One US Marine revealed that not only did his unit habitually refuse to take Japanese prisoners – shooting any who tried to surrender – but that they were taught to believe that the Japanese were an ‘inhuman race’. And battle fatigue as they fought this ‘inhuman’ enemy was so intense that he recalled that he had spent one night hallucinating that he was fighting the Japanese only to discover in the morning that ‘there were no Japanese there’. As for soldiers of the Japanese Imperial Army, they were ordered to conduct a defence of the island of Okinawa that they knew would almost certainly lead to their deaths. Instead of trying to prevent the Americans from landing on the island, they retreated island into carefully prepared defensive shelters. Here they planned to show their bravery by giving up their lives for their Emperor. You can listen to one Japanese soldier who fought on Okinawa, Hajime Kondo, in the Testimony section of the site. He talks revealingly of the reasons why he thought he ought to kill himself on Okinawa – and why he survived. The war on the eastern front in the Soviet Union was truly horrendous, but there was a special, intense kind of nastiness to the war in the Pacific. And that was the war in which history placed Lemeul Shepherd Junior.